The adult Sunday School class meets each Sunday from 9:00-9:50 in the Parish Hall. The class name, Faith Matters, denotes the two-fold emphases of the class. Faith Matters (verb) indicates that the class participants hold as important the Biblical and historical traditions of Christianity. Faith Matters (noun) indicates those items in daily lives with which as humans we struggle and to which the Biblical literature and historic traditions can bring light and clarity. It is the class practice to provide a comfortable meeting place in which adults may examine and express views and beliefs (sometimes orthodox, sometimes not so much) about contemporary issues with openness and tolerance to others who may have different understandings. Some of the past class topics include: what it means to call the Episcopal faith a “Faith for thinking People;” Fear of Others, a book by William Willimon; atonement and the penal substitution interpretation of the death of Jesus; end of life Issues, a conversation with experts in the medical and health professions; The Misunderstood Jew, a book by Amy Jill Levine; the Kingdom of God and the American Dream, a look at the impact of capitalism on Christianity; a close look at the passion narrative in the Gospels (during Lent). The curriculum is created by the class. Normally, at the end of May, the members suggest topics or themes for the following year beginning in September. Each topic is explored for four to six weeks. Consideration of the issues or topics always include what the Biblical witness and the historical traditions of Christianity contribute to an understanding or clarity of a discussion item. In the three months of summer, the class is more informal. Each week members bring an issue, concern or topic for discussion each Sunday. The class is led by Bill Rich, Ph.D., retired faculty, Elon University. EFM begins its ninth year at St. Andrew’s in the fall of 2018. Participants meet once a week for thirty-six weeks, a schedule with breaks for various holidays during the year. Although EFM is a four-year program, participants are asked only to commit to one year at a time. 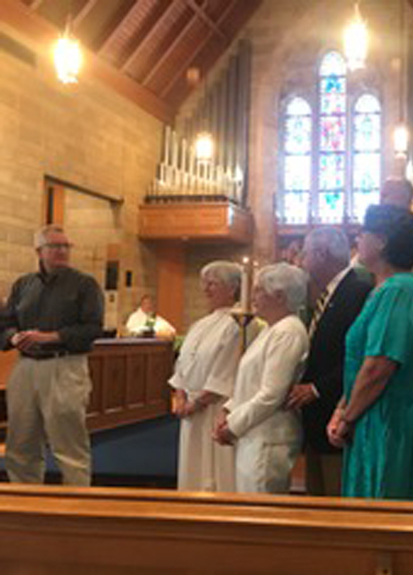 Each year is independent of the others with readings changing annually from Old Testament (year one) to New Testament (year two) to Church History (year three) and Christian Theology (year four). In addition to readings in the Bible, a reflection guide and two additional books are used for weekly assignments each year. Learning objectives are set by the individual participants who normally spend six or more hours weekly in preparation for the group meeting. A major emphasis is the development of skills in theological reflection, a major underpinning of a Christian ministry. A study group consists of at least six and no more than twelve persons plus either one or two mentors. A seminar fee is required for materials. The Diocese of East Carolina and St Andrew’s have some limited scholarship funds as well as a monthly payment plan. For more information on the program, see EfM.sewanee.com. There is also a “Children’s Chapel” during the 10:00 a.m. service for children kindergarten to 4 th grade. 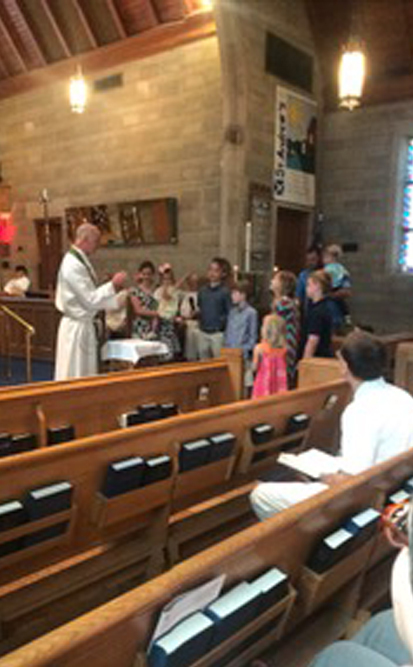 These children are called forward at the beginning of the service and depart the sanctuary — they return to the service just prior to the Eucharist.